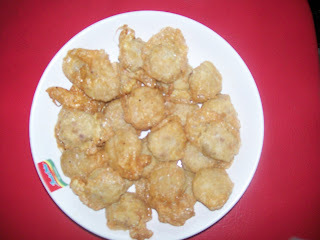 Perkedel is an Indonesian food. It is usually serve with Indonesian Soup. First, make smooth the beef , and then steam until ripe. Fry the potatoes until colors is change in golden brown, then make smooth the frying potatoes. Mix the smooth beef and potatoes, add smooth garlic, add salt to taste. Take out 1 spoon of beef and potatoes mixed. Take in to egg mixed. Fry until perkedel change in to golden brown. Serve with hot Indonesian Soup.